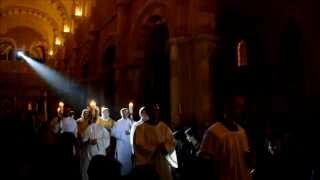 Shortly after its foundation in the 9th century, the Benedictine abbey of Vézelay acquired the relics of St Mary Magdalene and since then it has been an important place of pilgrimage. St Bernard preached the Second Crusade there in 1146 and Richard the Lion-Hearted and Philip II Augustus met there to leave for the Third Crusade in 1190. With its sculpted capitals and portal, the Madeleine of Vézelay – a 12th-century monastic church – is a masterpiece of Burgundian Romanesque art and architecture. 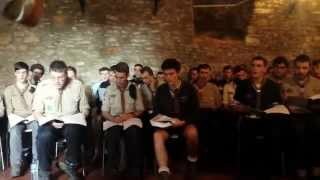 Pèlerinage des Scouts d'Europe à Vezelay. 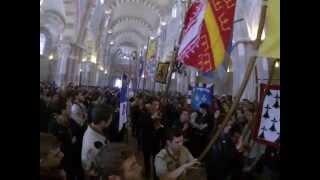 Répétition du Grand Coeur de Vézelay2014, rassemblement de Routiers Scouts d'Europe en marche vers la Basilique Ste Marie Madeleine de Vézelay. 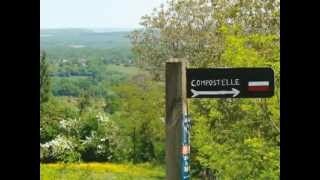 Les meilleurs moments de la sortie Vezelay ainsi que le nord de l'Yonne. 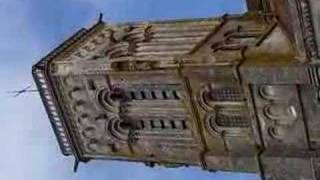 the bells ring loudly for 12 noon in the tower of the basilica of mary magdalene in vezelay, france.